22 • RV PRO • June 2018 rv-pro.com O R I G I N A L E Q U I P M E N T HSM shipped 210,000 step units in 2017, and those num- bers are expected to increase substantially this year with the exit of a competitor's interest in the steel entry-step business. "Our involvement and numbers are going up overall," says Mark Snyder, national market director for HSM. "We're set up to absorb all of that additional business and we'll easily eclipse 2017 numbers with expectations of more than 300,000 units sold in 2018." HSM also is looking forward to new opportunities for its RV customers, such as adjustable mattresses and LED lighting, and building and strengthening industry relationships. One reason for the company's sudden growth in its RV division is the result of a rebranding. HSM celebrated its 70th anniversary in 2014 after having rebranded itself to HSM from Hickory Springs Manufacturing in 2013, as well as retooling its corporate structure and website. The company was originally founded as a supplier to the home furnishing market in the "furniture belt" of North Car- olina, where its present-day headquarters is located. "As we branched out into a more diverse market base, our name had remained Hickory Springs, which wasn't indicative of who we have become," Snyder says. "The change to HSM was made to eliminate the association of only manufacturing springs in Hickory, N.C., and take advantage of our other capabilities and products that we have to offer, such as our RV steps. It opened us up to greater visibility in other markets." 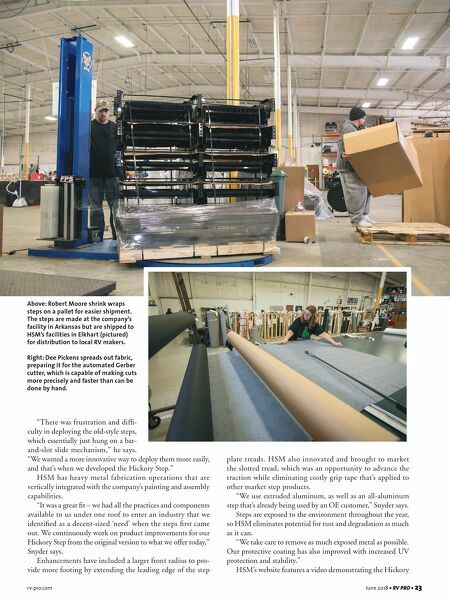 HSM has four segments in its corporate operations: home furniture, diversified marketplace, bedding, and transportation and specialty manufacturing (TSM), the last of which features HSM's RV products that are manufactured at the company's 350,000-square-foot facility in Arkansas. HSM began shipping steps in 1996, when the company real- ized there was opportunity to build a better product, according to Snyder. 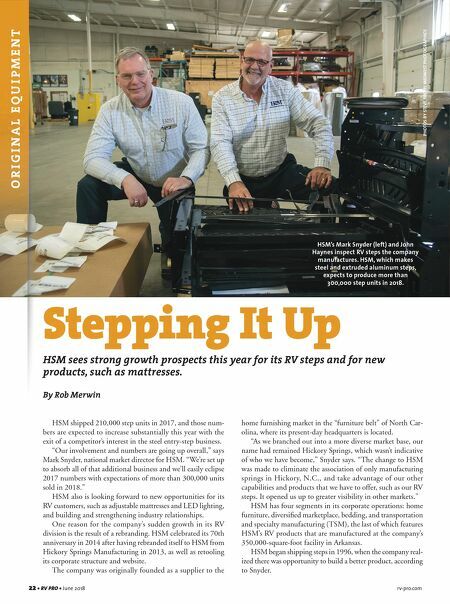 Stepping It Up HSM sees strong growth prospects this year for its RV steps and for new products, such as mattresses. By Rob Merwin PHOTOS BY STEVE TOEPP/ MIDWEST PHOTOGRAPHICS Left: HSM's Mark Snyder (left) and Jeff Henry inspect RV steps the company manufactures. HSM, which makes steel and extruded aluminum steps, expects to produce more than 300,000 step units in 2018.